Alexander von Humboldt - ARTE AMAZONIA provides a global voice through art for the indigenous cultures of the Amazon. Largely overlooked by American historians, Friedrich Wilhelm Heinrich Alexander Freiherr von Humboldt , September 14, 1769 – May 6, 1859), was a Prussian geographer, naturalist and explorer whos work on botanical geography laid the foundation for numerious scientific fields, including for example ecology, ethnobotony, biogeography and helped define most of the contemporary environmental sciences. 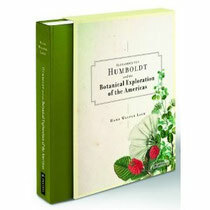 Between 1799 and 1804, Humboldt travelled extensively in Latin America, exploring and describing it for the first time generally considered to be a modern scientific point of view. 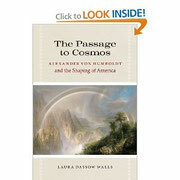 His description of the journey was written and published in five volumes over 21 years, Kosmos (1845), attempting to unify the various branches of scientific knowledge. In February of 1800, Humboldt and Bonpland travelled the Orinoco River. This trip, which lasted four months and covered 1,725 miles (2,776 km) of wild and largely uninhabited country, had the important result of establishing the existence of the Casiquiare canal (a communication between the water-systems of the rivers Orinoco and Amazon), and of determining the exact position of the bifurcation, as well as documenting the life of several native tribes such as the Maipures and their extinct rivals the Atures. 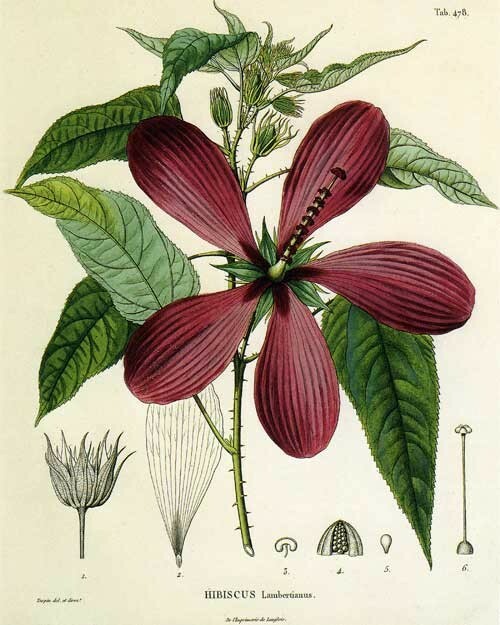 Additionally, this excursion offered him exhaustive access to tropical botanicals which he intricately illustrated paving the way for further South American landscape art. Baron Alexander von Humboldt. 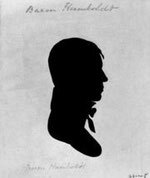 Thomas Jefferson Foundation, Inc.
Hunboldt's South American adventure concluded in the the United States and with a meeting with Thomas Jefferson where they exchanged theories of science and politics. 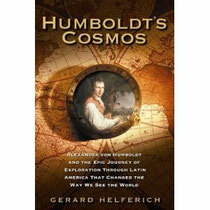 Humboldt left a lasting mark on the thinking of his times and influencing many. 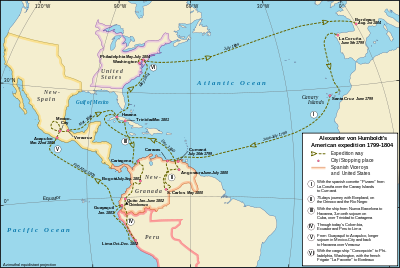 He was one of the first to propose that the lands bordering the Atlantic Ocean were once joined (South America and Africa in particular). Humboldt supported and worked with other scientists, including Joseph-Louis Gay-Lussac, Justus von Liebig, Louis Agassiz, Matthew Fontaine Maury and, most notably, Aimé Bonpland, with whom he conducted much of his scientific exploration. Most notably, Darwin expressed the imprint Humboldt made on him as he recalled reading "with care and profound interest Humboldt's Personal Narrative" and finding it one of the two most influential books on his work, which had "stirred up in me a burning zeal to add even the most humble contribution to the noble structure of Natural Science."